Description: NS 328 switches off the Dundas Sub. to take the "Cowpath" to the Grimsby Sub. heading to Buffalo, NY. 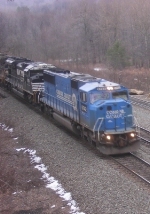 Description: NS 6742 (ex-CR 5618) leads an westbound freight. Description: Side by side awaiting crew changes. Description: A former Conrail unit and it's auto-train cross the Diamond at Hair. Description: Behind the VFW, 0741 hours. Description: A fourth eastbound/northbound train! UP train QLINSB on NS trackage crosses Bayou St. John in New Orleans. The QLINSB is a run-through train originating at the UP's hump yard at Livonia, Louisiana. It terminates on the Norfolk Southern in New Orleans, but a large block of it goes northbound to Birmingham, Alabama, (hence the "B" at the end of the train's name) on a northbound NS train. Description: UP train QLINSB on NS trackage crosses Bayou St. John in New Orleans. The QLINSB is a run-through train originating at the UP's hump yard at Livonia, Louisiana. It terminates on the Norfolk Southern in New Orleans, but a large block of it goes northbound to Birmingham, Alabama, (hence the "B" at the end of the train's name) on a northbound NS train. The Wisner Boulevard overpass is seen in the back. Description: This mixed freight is lead by an ex-CR SD60I, as it coasts down the hill at the Cassandra overlook. Description: All is quiet on the SideTrack.